Each visitor must be 14 yrs. of age with picture identification. No visitors will be allowed in the lobby more than 30 minutes before visiting hours and no unattended children will be allowed to wait in lobby. Each inmate is allowed 2 - 30 minute visits per week, maximum of 2 people per visit. First come, first serve. Inmates provide the facility a 5 person list each month for visiting. Visitors must be listed on that list to visit. Fridays 7pm - 8pm only. Parents only. Nothing else will be accepted. All other items such as toiletries may be purchased through inmate store. Prisoners sentenced to the St. Joseph County Jail will pay $30.00 per day room and board. If not paid, civil action will be taken by the county. All correspondence must be mailed to the resident of this facility. All incoming correspondence (other than legal correspondence) must be a 5" x 7 " or smaller prepaid postage postcard. No drawings or other markings are permitted on correspondence. Clearly mark the resident's name on the postcard and mail through the US Postal Service, UPS or other agency. All correspondence is subject to search at this facility. Packages will only be accepted for inmates when previously approved by a Corrections Sergeant or an Administrator. Please call before mailing any packages to the facility. All packages are subject to search at this facility. All money must be deposited into the residents account. The facility accepts money orders, and cashiers check. No personal checks are accepted. Monies may be deposited in the Kiosk in the front lobby or may be mailed in to the facility. Do not send cash in the mail. Money can be loaded into an inmate's account over the Internet using a credit or debit card with expressaccount.com. A fee will be charged by Express Account for this service. All interim bonds must be made in the inmate's name. We accept cash, cashiers check or money orders for bonding out on cash type bonds. Bonding Companies will explain their procedures as they are contacted. A list of approved Bonding Companies can be obtained from the jail. Property must be picked up within thirty days of the final release of a resident or it will be disposed of. It is the inmate's responsibility to advice someone prior to leaving the jail. Property may be picked up any day of the week. The facility provides for a weekly commissary order to be placed by a resident. Orders are taken on Tuesdays and normally delivered on Thursdays. Family and friends may order some items for a resident through the Internet web site Express Account (External Website). Be sure to select St. Joseph County, MI on the first page. 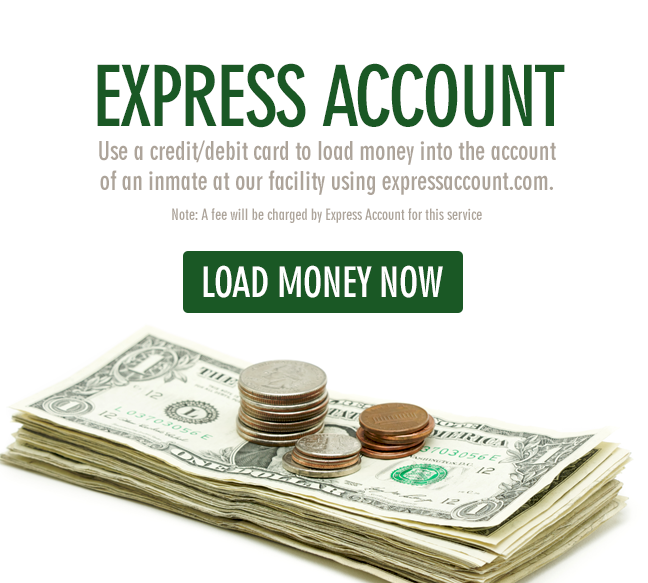 Click here for Express Account (External Website): Use a credit/debit card to load money into the account of an inmate at our facility using expressaccount.com. Note: A fee will be charged by Express Account for this service.